Hurricane preparation can be easy. Each window on your home or business can be secured in just minutes when you have permanently-installed storm shutters. You can step up your home security and building protection with strong shutters for windows, doors, storefronts and more. 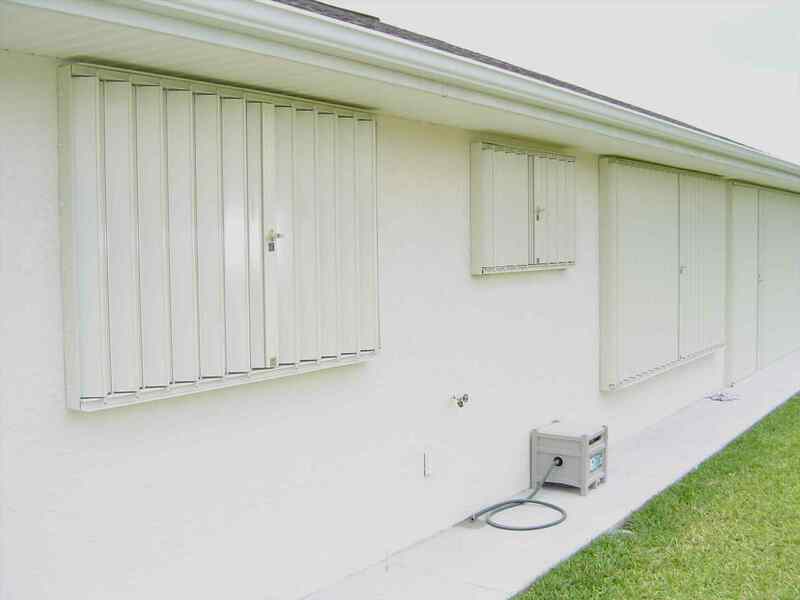 If you need hurricane protection, anti-theft protection, and want to guard your home or business against other threats in Jacksonville, Florida, you need accordion shutters from Empire Construction & Development. Dependable storm protection – Floridians need hurricane protection. Hurricanes and tropical storms can bring high winds and quickly create dangerous conditions. 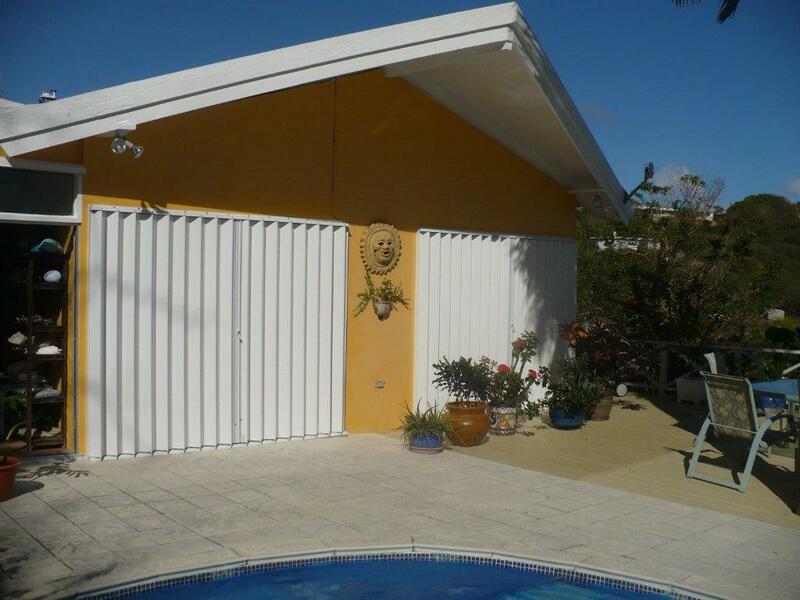 People used to rely on plywood, storm panels, and maybe clamshell awnings for their storm protection before accordion shutters were available. But now, if you don’t want the hassle of hammering plywood and hanging panels the day before a storm, accordion storm shutters are a better choice. These hurricane-rated shutters will allow you to quickly and easily cover windows, glass doors, patio areas, and other openings on your property before a storm hits. These shutters simply slide shut. Accordion shutters in Jacksonville from Empire Construction & Development are made to withstand high wind speeds, impact, and other harsh conditions. Theft protection that works – Security is a concern for many homeowners and business owners in Jacksonville. Covering storefronts overnight, locking up businesses when closed, and protecting their homes when out of town can give homeowners and small business owners greater theft protection and peace of mind. Accordion shutters from Empire Construction & Development make excellent security shutters for commercial and residential buildings. 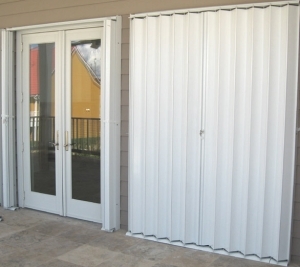 Protect your building from break-ins, vandalism, and other dangers by covering patio areas, storefronts, windows, and doors with strong accordion shutters. Our accordion security shutters are made of heavy-duty aluminum and are built with a secure locking device. Extreme weather protection too – Accordion shutters in Jacksonville can be used to keep your building cool when it’s hot outside. When closed, these shutters block sunlight and can be used to reduce the temperature of a room, which can help lower your cooling costs. Accordion shutters are easy to open and close, so you can cover a large or small window when you need to, and then easily open your shutter again when you’re ready to. 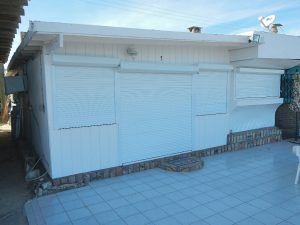 For the best accordion shutters in Duval county and north Florida, order your shutters from HurricaneShuttersFlorida.com. Contact us for a quote on the price of accordion shutters in Jacksonville, contact us or call: 888-474-3555 to hear about this month’s shutter deals and special offers. Get the accordion shutters you need in Jacksonville, Florida from Empire Construction & Development. You want to protect your home or business in Biloxi from hurricanes and other storms, severe weather, and maybe even break-ins. Windows and doors can be damaged by storms, and can be entry points for burglars and vandals – but so can patios, balconies, terraces and storefronts. Covering all the openings on your property that are vulnerable to storm damage and other safety threats is a good idea. But how do you protect your home or commercial building? What can you use? 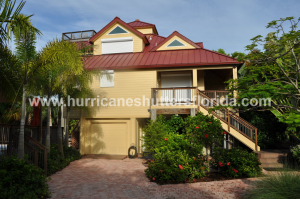 If you want strong, reliable shutters for your building, look no further than the expertly-made shutters you’ll find on HurricaneShuttersFlorida.com. What are the best storm shutters for my home? You’ll want to find storm and security shutters in Biloxi, Mississippi that are storm-rated, well-made, and look good on your home. Accordion shutters may be the right choice for you. These strong shutters are the most popular shutter we manufacture and sell at Empire Construction & Development. 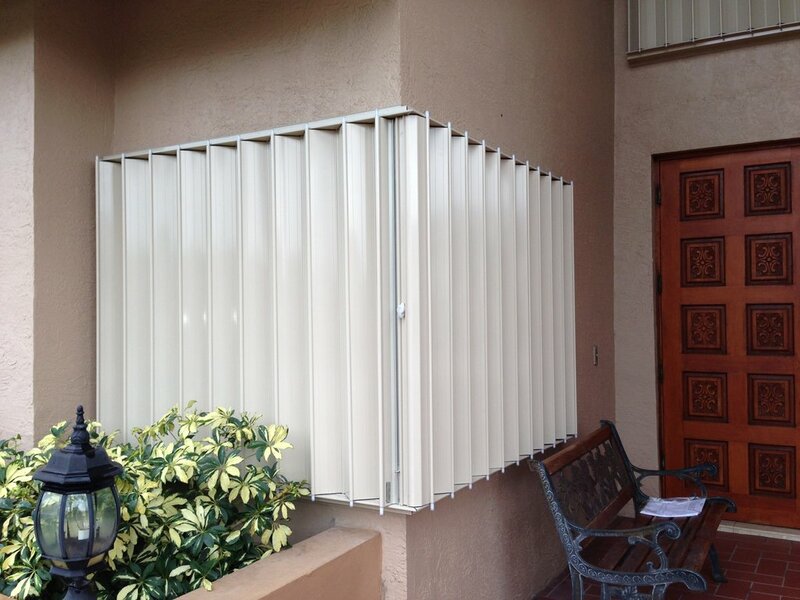 Accordion shutters provide great all-around storm protection and theft protection. These shutters are known for their ease-of-use and durability. Our accordion shutters are affordable too – another reason they’re a favorite among homeowners. We also manufacture custom shutters for homes and businesses, including: rolling shutters, Bahama shutters, and colonial shutters. For more information on choosing the best type of storm and security shutter in Biloxi, call: 888-474-3555 and one of our shutter experts will help you make the right choice. Can I use accordion shutters on my business? Yes, our storm and security shutters are suitable for use on commercial buildings, as well as residential ones. Commercial buildings on the Gulf of Mexico, such as hotels, resorts, restaurants, bars, retail stores, marine buildings, warehouses, and more can benefit from the effective storm protection and security that our accordion shutters provide. Accordion shutters from Empire Construction & Development are strong enough to withstand high winds, impact, and other extreme conditions. Maybe you want to cover up your storefront overnight, or secure a patio area when your business is closed — accordion shutters will let you do this easily. These strong shutters are tamper-proof, and are made with a secure locking device. Accordion shutters can be used to protect large and small storefronts, windows, and doors. These sturdy shutters can also be used on larger areas like patios, balconies, and terraces to protect against storm damage and other property damage in Biloxi, Mississippi. How can I order aluminum accordion shutters in Biloxi, Mississippi? You’ve found the right website! 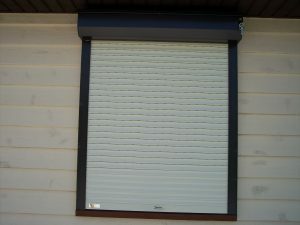 At HurricaneShuttersFlorida.com, you can order the accordion storm and security shutters you need. We will manufacture, package, and ship your custom-made accordion shutters to you. For a price quote on the most affordable accordion shutters in Biloxi, contact us with your window, door, patio, and storefront measurements. Call: 888-474-3555 to hear about this month’s shutter deals and for more information on ordering accordion shutters online. You can order the best accordion shutters in Biloxi, Mississippi for your patio, balcony, terrace, storefront, and more from Empire Construction & Development. What’s the best way to protect your windows and doors in Mobile? Your window and door protection should be sturdy, yet easy to use; it should be strong enough to keep your home or business safe, but it should still look good. Maybe you’ve been using plywood or storm panels, but if you’re looking for a better way protect your home or business, you’ve come to the right website! There are several great shutters for windows and doors you can use on your building, including our most popular product at Empire Construction & Development: accordion shutters. Theft and vandalism can be a year-round problem. Since you never can know when a break-in might occur, stay one step ahead of robbers and home invaders by covering windows, glass doors, and other vulnerable areas on your home or business with durable accordion shutters. These shutters cover windows and doors securely, are designed to withstand impact, and are made with a locking device. When accordion shutters are permanently installed on your windows and doors, you’ll be able to quickly and easily protect your home or business from tropical storms, tornadoes, hail storms, and other storms that may strike southern Alabama. Closing the accordion shutters on some or all of your windows and doors can help you better regulate the indoor temperatures of your building, even in extreme weather conditions. Accordion shutters can block sunlight and help keep a room cool during periods of extreme heat. You can close your accordion shutters for part of the day, or on part of your building, and slide them open again when you’re ready to, without hassle. Homeowners and business owners in Mobile should have good hurricane protection in place. Accordion shutters from Empire Construction provide top-quality storm protection at an affordable price. Get the best accordion shutters in Mobile, Alabama for your home or business, and hurricane preparation for your building will be simple. Accordion shutters in Mobile, Alabama can be used on homes, and can also secure windows and doors on hotels, restaurants, retail stores, warehouses and other commercial buildings. Our accordion shutters are strong and reliable. These strong accordion shutters are easy to open and close and can be used every day if needed. We custom-build each shutter order for our customers in Mobile, Alabama, the Gulf Coast, and throughout the US. At Empire Construction & Development, we make shutters you can count on. For a free quote on the cost of affordable accordion shutters in Mobile, contact us today or call: 888-474-3555. Get lifetime protection for your windows and doors with durable accordion shutters in Mobile, Alabama from Empire Construction & Development. Is your home or business ready for a storm? Are all of your windows and doors secured? When a storm is heading towards New Orleans, you may not have much time to prepare your home or business. If you don’t have storm shutters ready to go, you’re risking broken windows, property damage, and unsafe conditions in your home or place of business. If you’ve been through a storm in New Orleans before, you may have had to deal with a lot of cleanup, including window and door repairs. If you don’t want to have to go through all of that again, you can be prepared for the next storm by installing high-quality storm shutters for your windows, doors, patio, terrace and other vulnerable openings on your property. By permanently installing durable shutters on your windows and doors, you’ll have ready-to-use storm protection and security reinforcement whenever you need it. At Empire Construction & Development, we help our customers throughout Louisiana and the US keep their homes and businesses safe from storm damage, theft, and other dangers. Our aluminum accordion shutters are a top choice for storm protection and security for commercial and residential buildings. Durable accordion shutters in New Orleans, Louisiana can be used to protect commercial and residential buildings against natural disasters like hurricanes, other seasonal storms, tornadoes and high winds, and can be used to protect against theft and vandalism too. Accordion shutters are easy to use. These sturdy aluminum shutters are made to be installed on some or all of your windows and doors. Accordion shutters fold at the sides of each opening when not in use, and slide along a track to close when you need window and door coverage. Our strong aluminum accordion shutters are engineered to withstand high wind speeds and impact, and are designed to adhere to the toughest wind codes in the country. 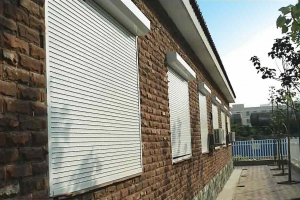 You can use our reliable accordion shutters on homes and rental properties, and on office buildings, warehouses, restaurants, retail stores, hotels and other commercial properties. Accordion shutters allow you to quickly ready your windows and doors for storms. Accordion shutters in New Orleans are a convenient way to lock up your restaurant or bar, cover your storefront overnight, protect large glass doors, and more. See what our customers have to say about our accordion storm shutters and our other storm protection and security shutters. Accordion shutters are easy to order from Empire Construction & Development. For affordable accordion shutters in New Orleans, Louisiana, visit HurricaneShuttersFlorida.com. For a free price quote on your new shutters, contact us with your shutter choice and your window and door measurements, or call: 888-474-3555 to speak to a member of our storm protection team. Don’t leave your windows unprotected. Let us at Empire Construction & Development help you keep your home or business safe with durable accordion shutters in New Orleans, Louisiana. You may have picked out the perfect windows when you moved into your home, and take pride in how nice they look. You make sure the windows in your office are clean, and keep your glass doors looking their best. Your windows are important to you – but burglars don’t care about your windows. Your home upgrades can be shattered when you’re out of town, overnight, or even in the middle of the day. And the damage done during a break-in can be costly and disruptive. To guard your home or business in Tampa St. Petersburg against break-ins, install high-quality rolling shutters on your windows and doors. Our roll-down storm and security shutters can be used on homes, office buildings, hotels, restaurants, bars, retail stores, warehouses, and other commercial and residential buildings in Tampa and St. Petersburg. Aluminum roll-down shutters are housed above each window and door, and can be rolled down whenever you need them. 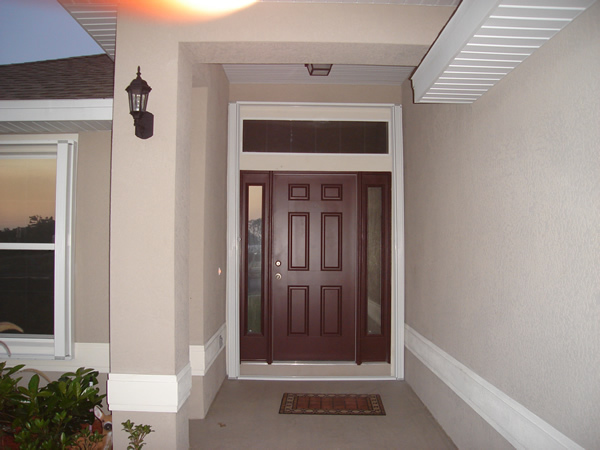 Affordable rolling shutters in Tampa St. Petersburg from Empire Construction & Development can enhance the look of your home and increase its value while making it more secure. Our rolling shutters are available in four roll-down shutter colors: white, ivory, beige, and bronze. Hurricanes aren’t the only thing that can break your windows and damage your doors in Tampa and St. Petersburg. Every window and door on your building is a potential entry point for a home invader or burglar. 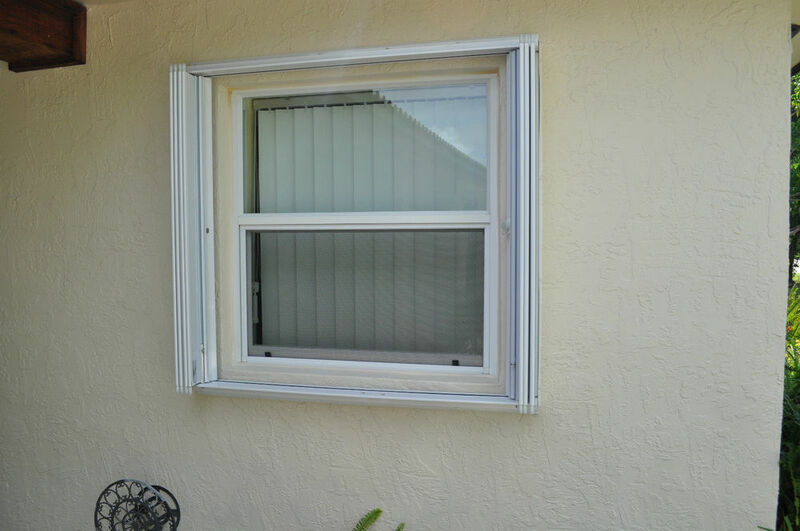 If you’re worried about home security, you can use strong rolling shutters in Tampa and St. Petersburg to cover your windows, patio doors, glass sliding doors, and other openings on your building. And when you do need storm protection during hurricane season, your new rolling shutters will do a great job shielding your windows and doors from flying debris during a hurricane or tropical storm and protecting your home or business from wind damage. Are your windows and doors as secure as they can be? You can stop break-ins before they happen when you protect your home or business in Tampa St. Petersburg with rolling storm and security shutters from Empire Construction & Development. You can keep your home or business safe from break-ins, bad weather, and other threats when you order rolling shutters online from our website: HurricaneShuttersFlorida.com. To find out the cost of rolling storm shutters, or for questions about finding the best rolling shutters for your home or business in Tampa St. Petersburg, contact us today. Call: 888-474-3555 to hear about rolling shutter deals and to buy rolling security shutters in Tampa St. Petersburg. Protect your home or business in Tampa St. Petersburg when you order rolling shutters for your widows and doors from Empire Construction & Development.